The Embroidered Truth | An ongoing search for inspiration and the good life. An ongoing search for inspiration and the good life. I’ve been thinking a lot lately about how being busy affects creativity, and I’ve come to the conclusion that it can be both a blessing and a curse. When I am busy at work, my ideas are better. The pressure created by deadlines lends enough urgency to spur my brain into action, and having several things to do makes me diligent about getting them all done. As the saying goes, “If you want something done, ask a busy person!” Getting things done creates its own momentum. 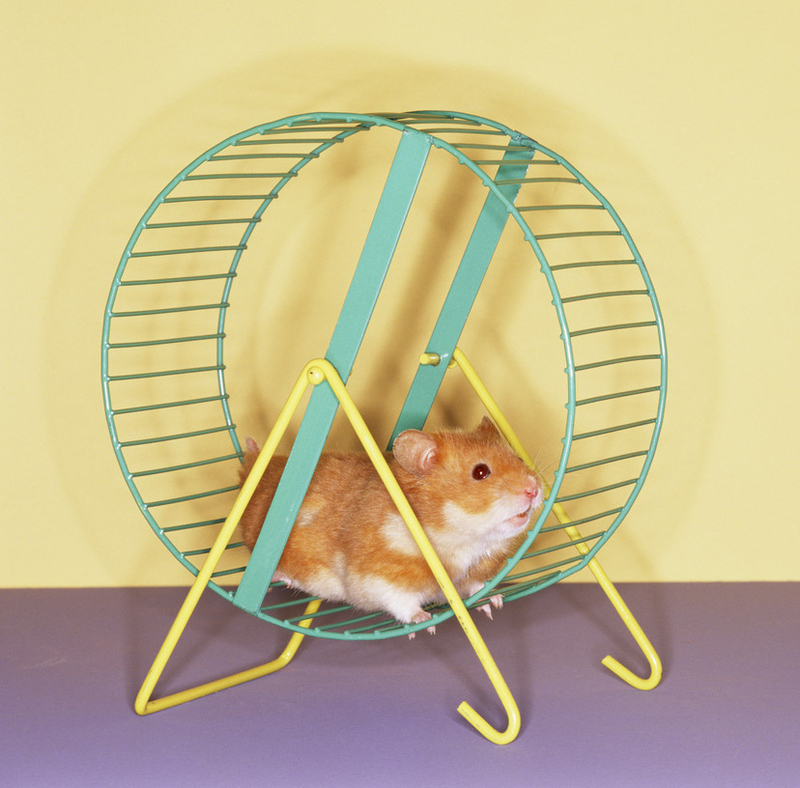 Sometimes, though, being too busy can take its toll. I usually have a lot to do after work, and often am not home several nights a week. This makes the time I do spend at home a precious commodity, and I am in such need of downtime that the only things I feel like doing are reading or embroidery. Anything that takes more creative thought or energy than that seems overwhelming. Introverts need time to charge their batteries away from other people, and highly sensitive people need time away from overstimulation. I am both. This is how I’ve felt for a while. The obvious answer is to scale back on the extracurriculars and spend more time at home so it is the norm and not the exception. Once the novelty of being at home wears off, a little rest, space and some good old-fashioned boredom might lead to more creative work. Scaling back is a hard thing to do. It means not doing some things you might want to do. It means disappointing or even angering other people because you’re putting what you need over what they want and expect you to do (and this is even worse when you are a people-pleaser by nature). I’ve learned that I do need to listen to what my mind and body are telling me; I am a happier, better rested, more creative person when I do, even if it means I do not participate in a show or do not meet with family or friends for a weekend. It doesn’t mean I don’t love them, but that they will like me better when they do see me. I am hoping to be more productive in the coming weeks. I’ll let you know how it goes! 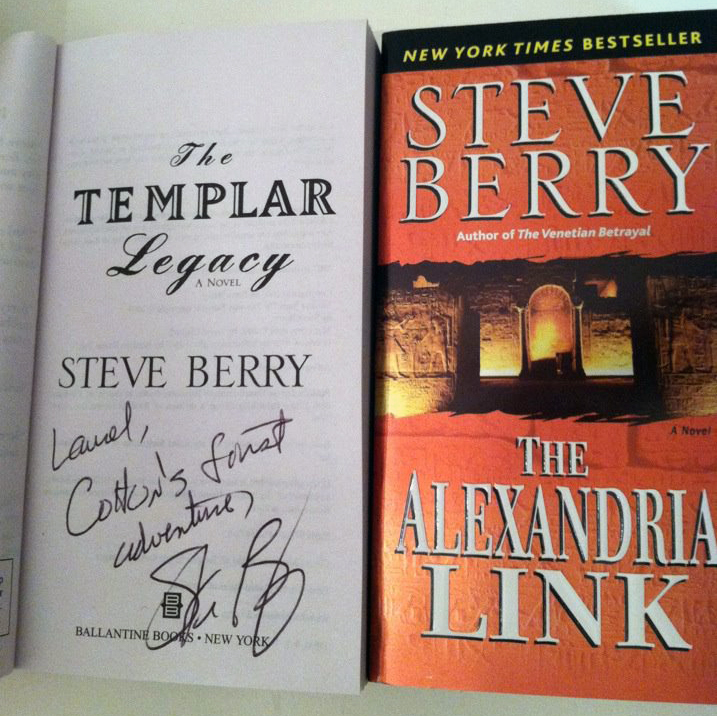 Yesterday I had the rare chance to meet one of my favorite authors, Steve Berry (The Venetian Betrayal, The Paris Vendetta, The Jefferson Key), at a program at the county library. He was there as the national spokesperson for Preservation Week, since he and his wife do a lot of fundraising for historical preservation work, but he also took some time to tell us about his upcoming novel and answer our questions about his writing process. With age 35 looming in the windshield, some of what he said about getting started hit a little close to home. As far as fiction goes, I have not written so much as a short story since I was a senior in college. When I was a kid, I loved to spend hours writing. I was constantly beginning grandiose novels full of good, beautiful (boring) heroines in times gone by who wore a dazzling array of costumes and were loved by good, handsome (boring) men. Later I experimented with some poetry (which was awful, and I am sorry if I forced you to read it). There was no doubt in my mind that I would be an author. My inner would-be novelist was scared off in 1998 by a creative writing class with the typical quota of know-it-alls. I had outgrown the beautiful, boring heroines and had no idea what I wanted to write about now, really, and it was probably a combination of lack of life experience and being scared to really write what I felt that led it to be a lackluster experience for me. Even so, writing a novel has always been on the bucket list. I planned to force myself to sit down and do it, NaNoWriMo style, last October, but then was cast in “A Christmas Story” at the community theater, so that was put on hold. I had high hopes for June, but am now torn between that and auditioning for a musical this summer. I have to admit I am scared of beginning the process and finding out that my ideas — or my ability to communicate them — are no good, or that I lack imagination to come up with something I will be proud of and actually show to someone else. Fear of failure is a dangerous enemy for a wannabe creative who is also a perfectionist. Hmmm -do I answer with theatre blog, personal blog, or the real answer, “not the novel(s) I should have written by now”? I think I responded with something close to (quoting J.K. Rowling) “Mimble wimble.” It’s not fun to have to admit you’re scared to start to someone you admire, folks. It’s hard to remember sometimes that my writing style is much different at age 35 than it was at age 21, and my outlook on the world is wildly different. A lot has happened in 14 years. I think just getting started at all will be a huge step in the right direction. Advice from other writers (or anyone else!) is certainly welcome! How did you get started and/or overcome insecurities? The F-word means different things to different people. If I’m talking about food, it stands for feta cheese – I think I am the only person in the world who hates feta. The most common meaning of the F-word is pretty much understood, but there’s one that is more personal to me: failure. Fear of failure is one of those cute little attributes of perfectionism that makes it very hard to try new things and explore creativity. (Ooh, fear is another F-word. I notice a trend.) It makes it hard to stand up and audition for shows, particularly if you really want a certain role. It makes you stay close to the edge of the ice-skating rink – well, that and the fear of bodily harm. 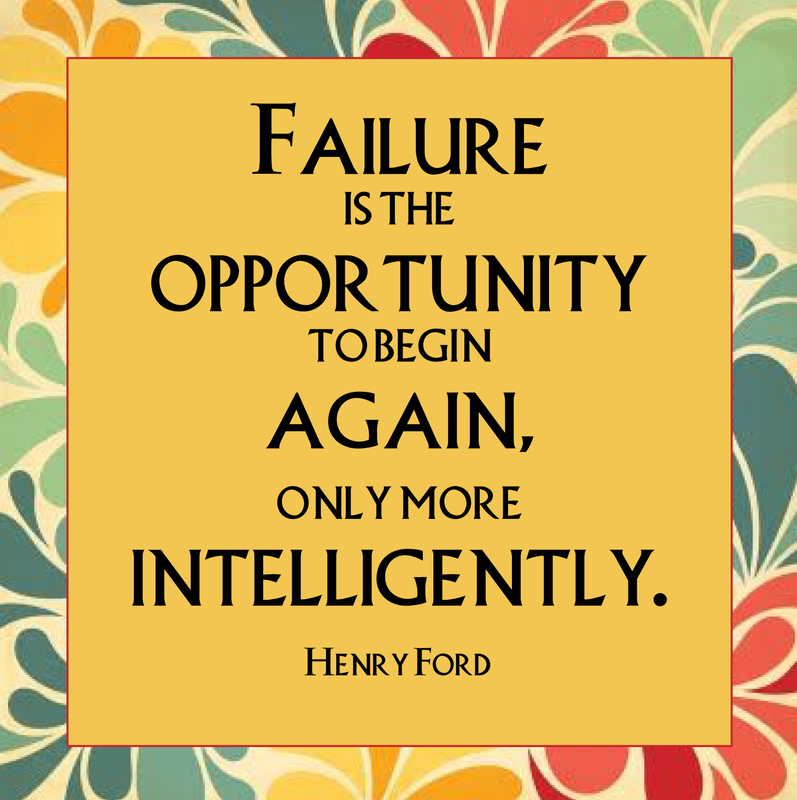 But if we don’t risk failure, how do we learn? Isn’t falling down part of learning to walk? Everything we’ve learned in our lives probably didn’t work perfectly the first time, so why is failing such a big deal? I think it’s because we tie the idea of failure to our identities. If I fail, I am worthless as a person. I’m not smart, I’m not creative, I’m not skilled enough, I’m not worthy to be loved because whatever I am trying to do did not turn out the way I wanted. There’s clearly something wrong with me. Walt Disney was fired by a newspaper editor because “he lacked imagination and had no good ideas.” He started a number of businesses that didn’t last and ended with bankruptcy and failure before – well, you know the rest. Colonel Sanders, founder of KFC, was fired from a dozen jobs after he left the army, and was practically bankrupt at age 65 before taking the risk that made his fortune. And the list goes on to include Henry Ford, R.H. Macy, Bill Gates, Albert Einstein, Winston Churchill, Oprah Winfrey, Fred Astaire, Lucille Ball, Vincent Van Gogh, J.K. Rowling – who knew I would have anything in common with such luminaries? So I guess failure isn’t a terrible thing, no matter what kind of heart attack it gives Snort. (Trust me, he’ll live.) That doesn’t mean getting comfortable with it will be easy. In fact, I’ll probably fail at that, too! I just have to view each failure as a learning experience that gets me closer to where I want to be, and that doesn’t sound so bad at all. How do you feel about fear and/or failure? How do you overcome them? I’d love to hear success stories! Start where the fun is! At our usual family lunch this Sunday, my grandmother proudly told me that my four-year-old niece, Bailey, had put together a 100-piece jigsaw puzzle in no time. I laughed too, because it sounds like Bailey and any other four-year-old I know – they want to do things their way. But then I thought, who says you have to do it a certain way? Why not start with the fun part? Why not just jump in where the joy is? Starting in the middle, where the fun part is, can be just what we need to keep our enthusiasm for a project – and for life. If the middle is where the joy lives, and the outside (or borders or boundaries) seems boring, maybe the spark generated by all that fun will carry over and make the outside exciting, too. Even if it’s not practical. Even if starting on the edges would make it easier. A little fun is worth some extra trouble! So eat dessert first. Start the puzzle (or the story, or the scrapbook page, or whatever) in the middle. Pick out the colors or fabrics before you’re sure of what you want to create. Be willing to see what happens when you start where the fun is. 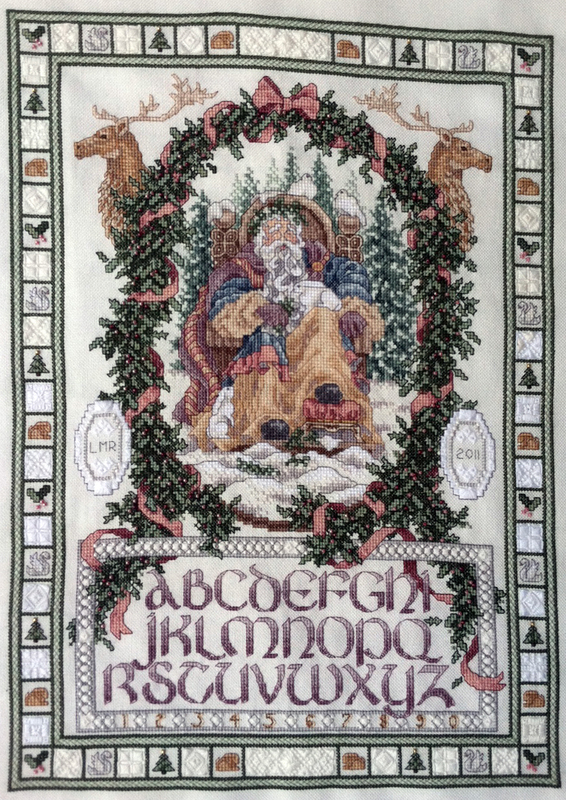 Father Winter, completed February 2012. 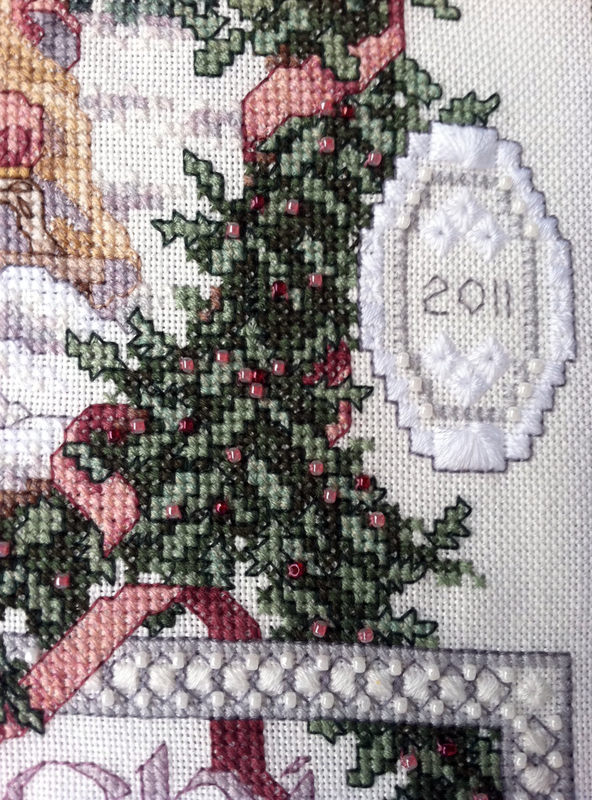 This was a stitching marathon. 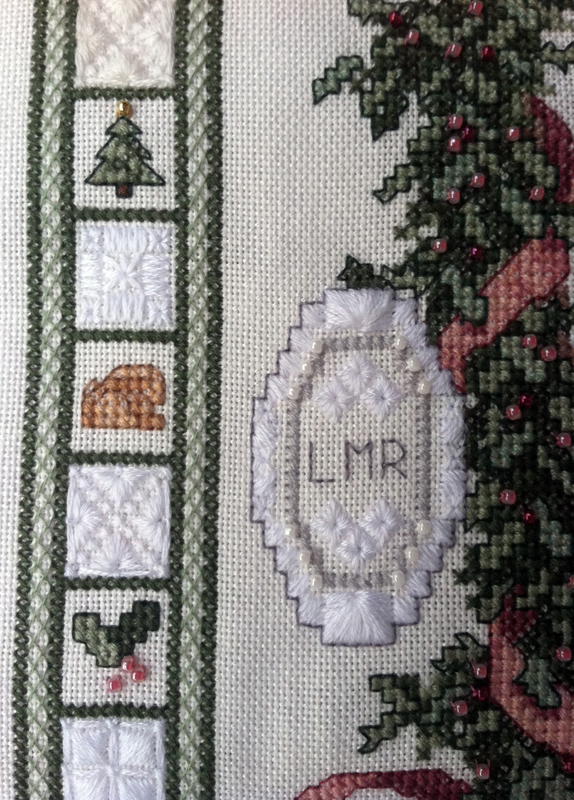 It’s a large design, with whitework specialty stitching and beading, and a complicated holly border around the central figure. I worked on this piece from July 2010 to February 2012, although not continuously; I laid it aside for several weeks at a time when life got in the way. 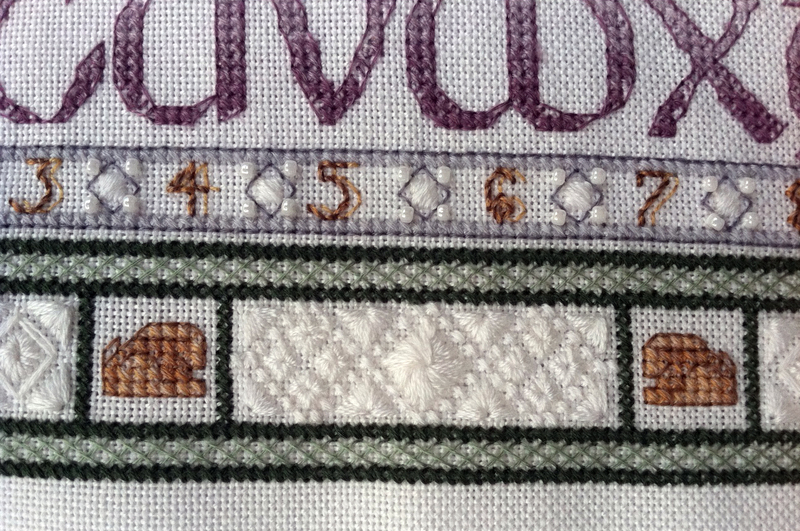 The right side border details. It really is a beautiful piece, and I am happy with the result. My next project is Joan Elliott’s “The Musician.” Happy stitching! It’s January. I can tell because it is cold outside (January and February are the two coldest months in Florida), and because I feel unmotivated and uncreative. It happens every year. Some people get rejuvenated at the beginning of the year, bursting gung-ho into resolutions to get in shape, eat better, clear out the clutter, etc. I am usually on board with all that, but for me the excitement does not last past a couple of days after New Year’s. 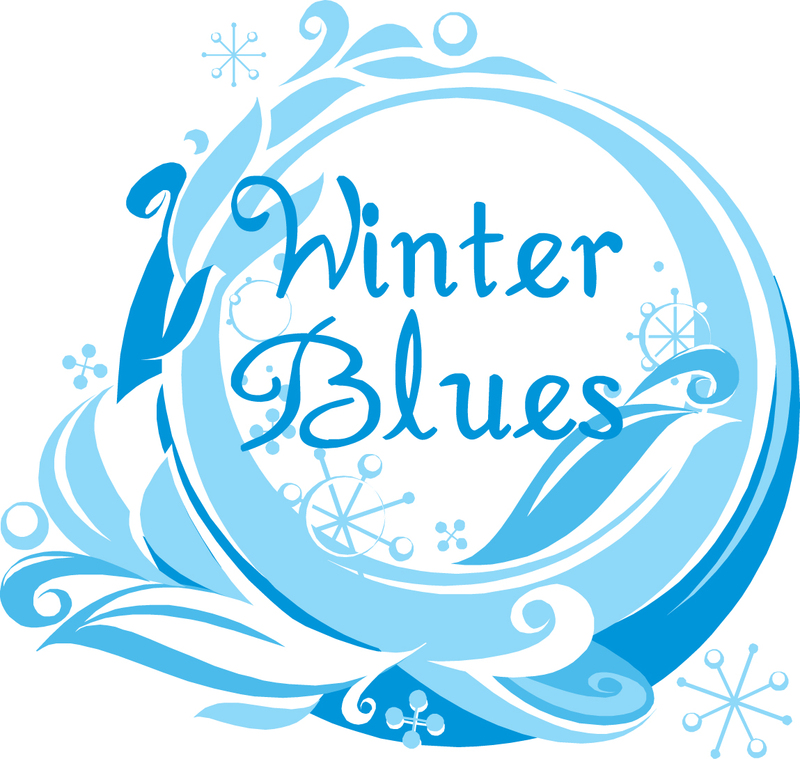 Then the reality sets in that the fun of the holidays is really over, the bleakest months are ahead, and the next work holiday is Memorial Day – five months away. Nothing seems like fun anymore. I become moody, irritated and restless, and start to let housework slide, which makes me mad at myself and therefore even meaner. None of this bodes well for my creative pursuits. The only thing I have felt like doing is working on my cross-stitch project, “Father Winter,” which is coming very close to completion. I have a long list of art and sewing projects I’d like to tackle, but starting something seems like a lot of trouble at the end of the day. Most advice on creativity tells you that the very act of showing up, whether you think you feel like it or not, will prompt you to create something, but I think it’s a fine line between giving yourself a swift kick for motivation and forcing yourself before you are ready. Forcing myself has never worked. If I am not ready to do something, I’m just not ready, and the attempts at producing creative work show it. I’ll eventually crawl out of this with the return of longer days and warmer temperatures, but I’d like to know: how do you stay motivated and creative during the winter doldrums? I can’t tell you how many times I’ve used that phrase as an excuse not to do something creative. The thing is, most of the time I don’t see it as an excuse; I just don’t feel like focusing my attention on a project, and if I won’t focus, what’s the point? Most of the chatter about creativity includes the advice to just show up, whether you’re in the mood or not. The act of just showing up and getting down to work on a project is half the battle, be that project a novel or a gym workout. This is the battle that is hard to win, because in the end, you are accountable to no one but yourself. It’s also interesting to note that certain emotions seem to contribute to creativity. Often, my writing is fueled by negative emotions. Hurt, betrayal, confusion, anxiety and fear drive me to put my thoughts on paper in an attempt to figure them out and calm them. (I’m really afraid that if anything ever happened to me and someone found my journals, he or she would think I was a complete train wreck.) Conversely, with artistic projects, I feel I do better and more productive work when I am feeling happy, loved and secure. I’m more accepting and less hard on myself when an idea does not work out, and more willing to try new things and take some risks. I never subscribed to the theory that you have to suffer for your art. For me, art is not about the expression of pain or loneliness, but about creating something beautiful that lifts the spirit, and I am most comfortable doing that from a happy perspective. So how do we get to the happy place? I’ve spent hours reading about this. Both Martha Beck and Gretchen Rubin suggest that we find happiness by being true to ourselves and following our passions. I think it also has to do with surrounding ourselves with people who love and support us and want us to succeed, and being thankful for the blessings we have in our lives. Really, sometimes all we need is to put a little perspective on our problems, compared to what so many people around the world face every day. At that point, it seems like a privilege to be able to worry that we’re not feeling in the mood to be creative today! Shifting the subject slightly, it’s been five months since I started the blog, and I thought a progress report might be in order. I don’t really have to think about it. The design is already drawn and charted, so all I have to do is execute. This raises some interesting (and kind of depressing) questions about creativity vs. skill. Stitching is not particularly creative unless you create the design; it is a skill that is perfected by lots of experience and attention to detail. It is beautiful and well-crafted, but it’s someone else’s creativity, like paint by numbers. As far as the scrapbooking goes, I’ve pushed it to the back burner, but hope to get back on the horse soon. My writing has been limited to this blog; I think I need a deadline to make me sit down and do it. I’ve often thought about NaNoWriMo, but it scares me. I planned to bite the bullet and do it in October, but I threw a monkey wrench into the works by getting cast in “A Christmas Story” at the GCP, so that will have to wait. The creative aspects of being in a show belong to another post entirely! I did drag out a new set of gouache paints a couple of weeks ago and play with those. I also took myself on an artist’s date to the art festival at Downtown Disney last weekend. The diet and exercise project is plodding along. I have good days and not-so-good days. Of course, with the play, going to the gym after work is out of the question until after the new year, but one positive change is that some friends and I have started doing Pilates or walking on our lunch hour a few times a week, so at least something is getting done, even if I do have to skip my date with the elliptical. Kittens. Positano. Eighteenth century wedding dresses. Craft tutorials. Wacky family portraits. Nutella. 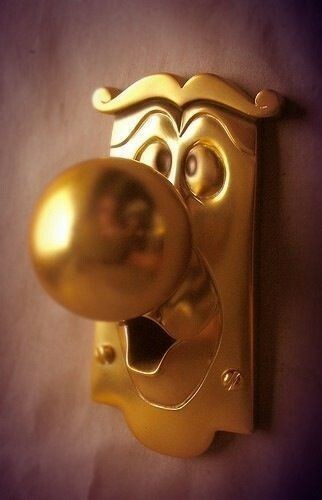 The Pinterest website is a sort of Portobello Road of web images. You can find anything here, including (and maybe especially) things you never dreamed you’d see or knew existed. Pinterest helps you save images you find online that you want to have on file in one convenient location. Some of the images I have collected on Pinterest. This is how it works: once you have registered on the site (they call it an invitation, but all you have to do is ask), you create virtual boards similar to a bulletin board you would have in your home or office. You can create the board before you add any images, or as you go along and get ideas. 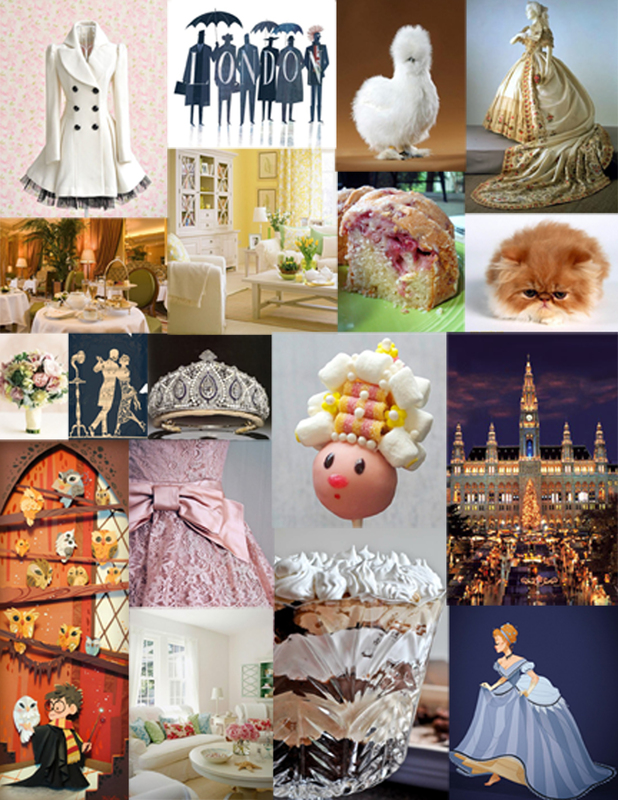 My first board, before I even started, was “Places I’d Like to Go,” followed quickly by “60s Dress Designs” and “Home Ideas.” I then searched the site for images that related to those boards and selected images I liked to put on them. You can also pin images from the web at large by telling Pinterest which website you want to pull an image from, or by using a special pin button you can install in your bookmark links. Pinterest is a social site as well, and encourages interaction among users by suggesting people for you to follow based on the things you tell it you are interested in. It also uses Facebook to find your friends who use the site and connect you with them. You can “like” or comment on any pin, or tag a friend if you want to bring a pin to her attention. Pleasures. Pictures, pictures, pictures, of anything and everything. Things I want to remember, to refer to later, to ponder and develop into new ideas. Pinterest has really opened up the internet to me; since every pin relays back to the website on which it was originally posted, I have discovered a lot of depth in my interest areas that was previously unknown. My art, fashion and food bookmarks on my browser have exploded. It also connects me to scores of people who are interested in the same things I am, while letting me explore some things that are new. I have tried one of the recipes on my food board (the strawberry greek yogurt cake) and will be making white chocolate s’mores bars for a party this weekend. On the work front, Pinterest has been extremely valuable for stocking up on ideas for graphic design projects. Interestingly, having so many images I like in place has shown me that I do have an identifiable style. Nice to know. Pitfalls. Oh my goodness, I had no idea how addictive this site would become. It is so hard to rip my eyes away from all the pretty stuff! I actually have to set a time limit now, or a couple of hours can go by without me noticing. Another peril is that you have to be careful when you are browsing or searching images; not all pins are PG, or even PG-13. I haven’t run into anything really bad yet, but questionable has happened several times. It also might not be good for your diet (what with all the dessert photos, many featuring the above-mentioned Nutella), but you can always turn to the many motivational photos if you need support! There’s a popular pin making the rounds that says something to the effect of Pinterest helping you feel creative while helping you avoid actually creating anything. I have certainly experienced this, but I have to say that since I started using it, the steady stream of visuals has really helped me feel more creative. That’s half the battle, isn’t it? I am not a morning person. I woke up this morning in the same mood as usual — tired, grumpy and a little fragile. I usually listen to satellite radio on the way to work, but this morning it was hard to find something I really liked, so I plugged in my iPod and set it on the “Favorites” playlist. 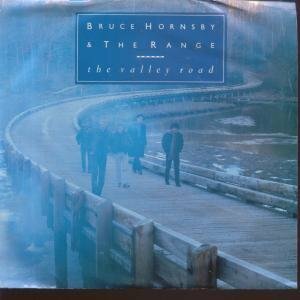 After a few ’80s New Wave songs, I was treated to an instant mood lifter: “The Valley Road” by Bruce Hornsby and the Range. There is something about that song (and many others of his), especially the piano accompaniment. It is incredible, to say the least. This started me thinking about other things that might share the same characteristics, and here is the grand revelation: this is the reason I never liked math or science. You’re probably wondering why this is so profound, but bear with me. Growing up in the “computer age,” it always seemed that students who liked and were good at math and science were considered to be a little smarter than those who excelled at language arts, history and fine arts. It’s not that I was bad at math – in fact, I was probably better than most – I just did not like it. 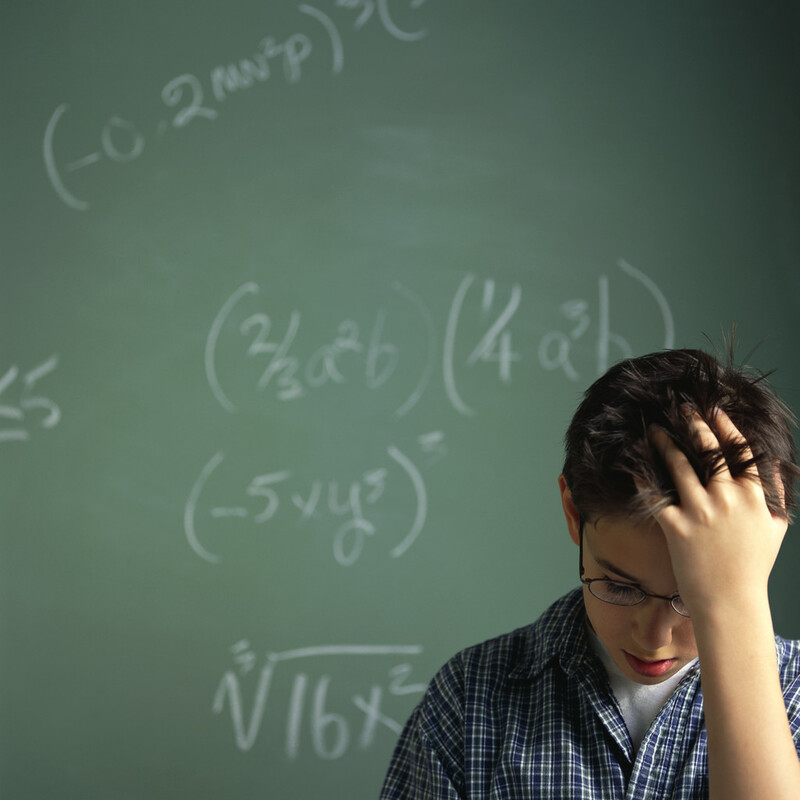 Every second spent in a math, chemistry or physics class was torture for me. Numbers and formulas were not interesting at all, and this morning I realized it’s because I did not find any room for creativity in it. I am an artist and a storyteller, and there were no stories in math and certain sciences, just formulas. Is it a surprise that the higher math discipline in which I performed the best was analytical geometry? At least we got to graph pretty flowers. Lesson here: math & science=smart, good, and contributing to society; creativity & art=not living up to your potential. I do not wish to imply that all sciences are devoid of creativity and self-expression. Some areas encourage individual thought and originality. I just never found that to be true for me. Does this have implications for the way math and science are taught? Could more students be reached if the need for expression is tapped into and addressed? If I had found those subjects to allow for some creativity or expression, I might have liked them better and put in more effort. Thank you, Bruce Hornsby, for leading me down the “Valley Road” this morning to an epiphany. I spent many years feeling like a second-class intellectual, but I am not less smart than someone who is fascinated by math and science. They simply are not interesting to me. I need outlets that value self-expression and creativity; others need formulas and order. My career is not less relevant because I create communications campaigns and graphics instead of bridges or x-rays. There are many different ways of seeing the world and contributing to it, and the right side of my brain says I am doing just fine. Don’t sit still – I might color you! Color has made me extremely happy the past week or two. Maybe a little too happy – I don’t seem to want to do much besides look up color schemes on the internet, drop them into Creative Suite programs and move them around! I’ve been hungry for new color combinations in my work projects, personal artwork, and clothes. My friends know I have never been afraid of using color. I will wear a bright yellow dress with red heels and a purple bag. (Shut up, it worked.) It’s all about how it blends and comes together. Some combinations are obvious: black, white and other neutrals work with just about anything; dark and light shades of the same color usually look nice. Depending on how you use it, color can make a powerful statement for or against you – color is a major factor in something appearing outdated. Lately I have been looking for schemes that use color in new, surprising and pleasing ways to keep things looking fresh. 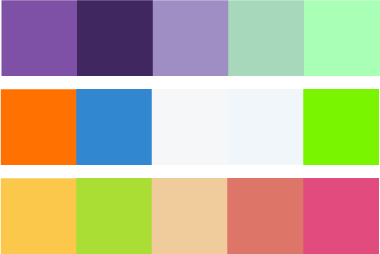 There are a lot of websites that focus on color. Adobe’s Kuler presents different schemes that are uploaded by the site’s users, and you can download the swatch files for import right into Illustrator or PhotoShop. Wear Palette shows you how to use color schemes in clothing, as does Cute and Little’s Color Brigade. Pantone has posted the top colors for the Fall 2011 fashion season (working on how to use these in publications), and Polyvore lets you put clothes together to see what works (see below, but I have to warn you, this is a major time-sucker — but really fun, especially since nothing has to fit you correctly!). 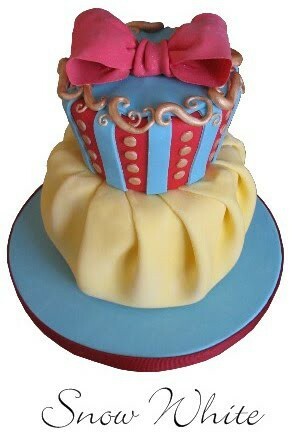 The yellow really helps it stand out, and there’s no black anywhere to be found! I like to play with color in a no-pressure environment before I use it, so often I will drag out the old Prismacolors and give them a whirl in a coloring book. 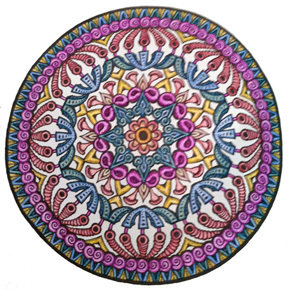 One of my favorites right now is “Mystical Mandalas” by Dover Publications. The designs are fun and give you a lot of room to play with shading and different combinations. Color also makes a huge difference in scrapbook layouts and quilts. I’ll have more on this soon – stay tuned!